Blowing things up, knocking things down and hitting things with sledgehammers; all ideal diversions for a quiet morning and now you can bring some of that destructive action to your computer screen. 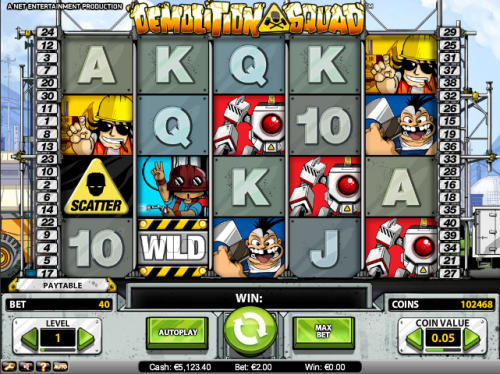 Demolition Squad is a groovy online slot from Net Entertainment; it’s a five reel and forty payline offering which is set against the backdrop of a construction site. The standard symbols are represented by solid-looking playing cards while the higher value symbols are all theme-related. We have a range of characters wielding a variety of demolition tools with a red-eyed robot as the most valuable. The scatter symbol is a yellow triangle warning sign and the wild is a big ‘Wild’ logo. If you can land the wild symbol on two reels separated by another reel (for example, reels two and four), those wilds will become Demolition wilds, destroying the symbol in between and transforming it into another wild. This obviously means three wilds in a row and big wins. Wilds do not have to be in the same row to trigger the bonus, diagonals are OK too. Land three of those scary yellow warning triangles and you’ll win ten free spins; get four or five and you’ll win twenty or fifty spins respectively. Any prizes you win in this bonus game are subject to a 3x multiplier and you’re also able to win more free spins by landing three or more scatter symbols. You can see by the video below that we won nothing on one of our free spin awards but usually you should see some profit. Demolition Squad probably doesn’t quite come up to Net Ent’s normal standards in terms of graphics and animation but that still means it’s well ahead of most of the competition. 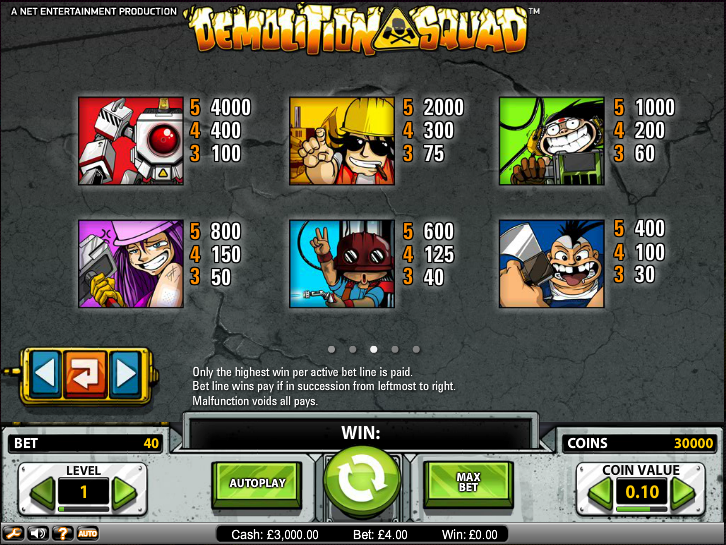 Despite our failure to profit from the free spins we give it a thumbs up.